The person who sent it to me is not usually someone to send out scams or spam, but, to me at least, this message, did not look legit. It smelled strongly of a phishing scam. 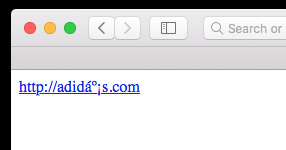 However, it was a link to adidas.com/shoes – so how was this going to phish me? Of course they are not giving away 3000 free pairs of shoes! Are they? Cautiously, I pressed on the link. 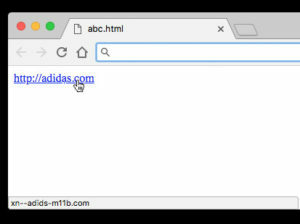 But, how did they get the link http://adidas.com/shoes to redirect to this dodgy site from WhatsApp? Two very different URLs indeed. This technique is similar to some personalised, or “cherished” vehicle number plates in the UK. The 4 is supposed to look like an ‘A’ in this particular example. This is known as a Homoglyph – where 2 characters look alike. So what’s the deal with xn--adids-m11b? However, some chat-applications (WhatsApp included at the time of writing) display the link as it was written. The first warning sign something is up – the redirection, or perceived redirection from adidạs.com to the punycode equivalent. But for a lot of people, particularly those who are not tech-savvy, this small detail may go unnoticed. Particularly if the URL bar is hidden on some mobiles. Or, more likely, them not understanding the correlation between what they click on, and where they end up. Another technique IDN attacks deploy is a quick redirect to a similar but believable domain name. Now, setting the puny-code domain (xn--adids-m11b.com) to redirect to adidas-shoes.gifts – would create something that looks more realistic – at least to those a little less tech-savvy. As I mentioned, in the Adidas example, they were phishing my personal data. Or a ‘buy now’ page – harvesting your credit card details. The fact they have their victims trust that they are on the legitimate brand site means they are free to essentially do what they want.